All the stops are out on this one, 12 tracks of dancin', drivin', backyard barbecuin' music. It's a party from beginning to end. 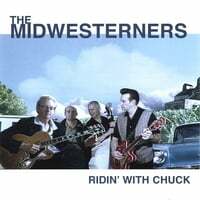 Madison, Wisconsin, May 2, 2006—The Midwesterners, long-haul roots rockers from Madison, are celebrating the release of their third CD, Ridin’ With Chuck. A performance at The Harmony Bar on May 13th will mark the official release of this 12-song CD, and the satisfying completion of a musical project that almost died. Literally! Almost one year ago, just after basic tracks had been laid down, but with dubbing and mixing still ahead, songwriter and band leader Richard Wiegel suffered a severe heart attack. Thanks to great medical care, Richard survived. And thanks to the help of family and friends, plus the support of the Madison musical community, he has been able to recover and put the finishing touches to Ridin’ With Chuck. Rockzilla World has described Wiegel as “one of the best songwriters in this genre.” Vintage Guitar says “fans of roots rock, Americana, country/hillbilly/rockabilly and cool guitar tones will find plenty to enjoy,” on Pretty Little Town, second CD from The Midwesterners. For more information contact Richard Wiegel at 608-255-0554, by e-mail at richardinmad@mailbag.com or visit www.TheMidwesterners.com. Ernie Conner (guitars, vocals) Tom McCarty (upright bass). Special guest on Ridin’ With Chuck: John Chimes (piano). It is close but this might be my favorite CD by The Midwesterners. Great music but I feel that the recording does not fully capture the stage presence you feel when you see them in concert. Excellent music from excellent musicians none the less.